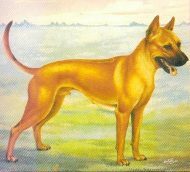 The Thai Ridgeback Dog of Thailand, also known as the " Mah Thai Lung Ahn" is one of the oldest breeds of stock within the dog world. These Thai Ridgebacks were used for hunting (they are keen sight hounds) deer, tapirs and birds in dense jungle, as guardians for family homesteads and as companions for carts, the traditional mode of transportation in these areas. 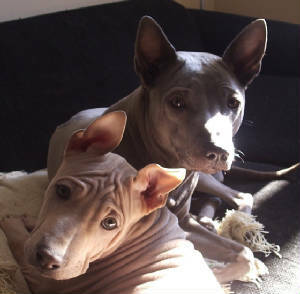 Thai Ridgebacks originally came from the Pho Quoc Island originally part of Siam, now a part of Vietnam. 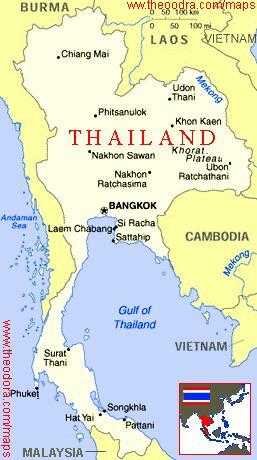 It is the major isle in the Gulf of Siam, about 200 km south of Bangkok. As a result of the isolation of the area, there was no chance of cross breeding with other breeds. Due to natural selection only the strongest and fittest dogs survived,creating the very healthy dog we know. "The dogs are big. They are more than two sawk tall (one sawk is a traditional measurement which equals the length from an adults elbow to his finger tips). They appear in a variety of colors. And each dog has a ridge on the back. They are fierce. They are loyal to their masters. They are able to feed themselves, digging the earth in search of small prey. They like to follow their owner, to hunt in the wood. When they catch an animal they will bring it to their master. They are loyal to the entire household. They love their companionship. They go everywhere with their masters, even as far as the big yang tree. They are powerful and fearless.... Their ears are pointed erect and their tails stand like the swords of tribesmen... "
This breed was first recognized by the Dog Association of Thailand, then the Japanese Kennel Club, and the Asian Kennel Union and finally, as breed number 338 by the FCI in 1993. They are also recognized by the Kennel Club of Thailand,the United Kennel Club and the American Rare Breed Association.